Patricia Cain - a pastel artist and writer with a major interest in the practice of drawing - has won the £25,000 Threadneedle Prize 2010 for figurative art. This means that this Prize has been won by a female artist in every one of the first three years of its existence. Sheila Wallis won in 2009 and Nina Murdoch won the inaugural prize in 2008. It's really good to see works in pastel being appreciated in a competition of this kind. One of the unique aspects to Patricia Cain is that she is a woman of many talents. She started out studying art - then switched to the law, gained an LLB, passed her Law Society Finals and spent the next 15 years alternately practising as a Solicitor in England and subsequently Scotland and studying to complete a Fine Art degree in Cumbria and her PhD in Fine Art at Glasgow School of Art! 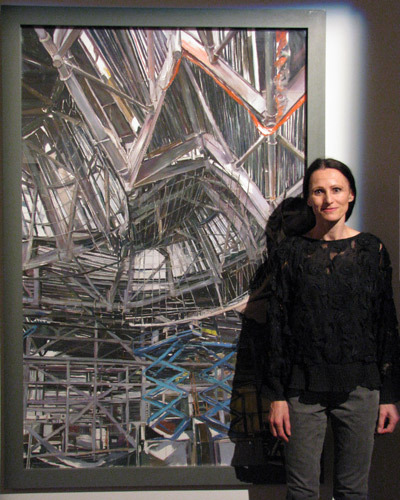 She has been an Honorary Research Fellow with the Humanities Advanced Technology and Information Institute at Glasgow University and currently works as a Curator at the Royal Glasgow Institute Kelly Gallery as well as being an active and award-winning practising professional artist. She says she has no regrets about giving up the law to become a full time artist! the Aspect Prize in 2010 which aims to help talented painters realize their full commercial potential. Inscape II won the Daler Rowney Award at the The Pastel Society Annual Exhibition 2010. Patricia has also been invited to apply for membership. Patricia lets her eye choose her subjects and says she's found that she seems to like structures which are half built. She commented that all the construction workers at the Zaha Hadid-designed Riverside Museum in Glasgow have been hugely supportive of her project of recording the process of it being built. Drawing in this instance neessarily involved drawing with a hard hat on! What's particularly interesting is Patricia's approach to her work which she describes in her 'artist statement'. Working in a way where the making leads the process very often means 'not knowing what you're doing', and I’ve been using drawing, painting and writing as a means of exploring the explicit and implicit aspects of my own thinking process. I've written about how it’s possible to examine one’s own ways of thinking through making drawings as part of my research. My own particular process begins by allowing my eye to chose my subject matter for me, and very often I'm drawn to complex structures which through making and observing, I find myself having to make sense of. I have latterly looked to my urban environment in Glasgow where I live for my subject matter. The more I make things, the more familiar I become with my working processes and understand how through an interaction of the known and the unknown, my thinking process evolves. I once heard James Spence say that an artist should consider himself lucky if through making art he came to know himself better, and I very much agree with his sentiment. The title of her PhD Thesis, Glasgow School of Art/Glasgow University was Drawing as coming to know: how is it that I know I make sense of what I do? and I suspect it forms a substantial part of her new book (see below). I was interested to find that we both shared a tutor in common - Jeanette Barnes whose practice and teaching is very much focused on the construction of large spaces and large interiors. The Threadneedle Prize Exhibition continues at the Mall Galleries until 5pm on Saturday 18th September. Patricia's new book about Drawing - published in June this year - is about how drawing as an eanactive process helps us understand the world. Enactive knowledge is knowledge that comes through action and is constructed through the use of motor skills. the USA - Drawing: The Enactive Evolution of the Practitioner. Patricia's husband, Sam Cartman frames her work and I talked to him about how to present a pastel as a conventional painting - ie without a mat. I'd observed in the Pastel Society exhibition back in April (see The Pastel Society - Annual Exhibition 2010) that this was becoming amore popular method for framing pastel works. Bear in mind this is a very large work. He used a six foot paper wrapped wooden spacer inserted into the rebate of the frame of Building the Riverside Museum. The side spacers then hold in the two similar shorter spacers top and bottom. The object of the spacer is, of course, to ensure that the pastel work does not touch the glass. I'm a particular fan of the drawn image - this is masterly. Thanks for helping me discover the work of Patricia Cain. I intend to explore her website thoroughly! 12th September 2010: Who's made a mark this week? 5th September 2010: Who's made a mark this week?